Thermostat Gas filled type. Accurate to ±0.5°C. Range 5-35°C. ON/OFF SWITCH: Double pole rocker switch controls electricity supply to heater. A neon indicator illuminates when the switch is set to ON. THERMOSTAT: Rotary control marked 8 (frost) 1-6. Each mark represents approximately 5°C. Finned, metal sheathed mineral type. There are two elements fitted to each model on flexible mountings to prevent expansion. The PLX200 Panel Convector Heater has a loading of 2.0kW. High accuracy adjustable thermostat responds to very small changes in room temperature to virtually eliminate temperature drift. Do not place material or garments on the heater, or obstruct the air circulation around the heater, for instance by curtains or furniture, as this could create a fire risk. 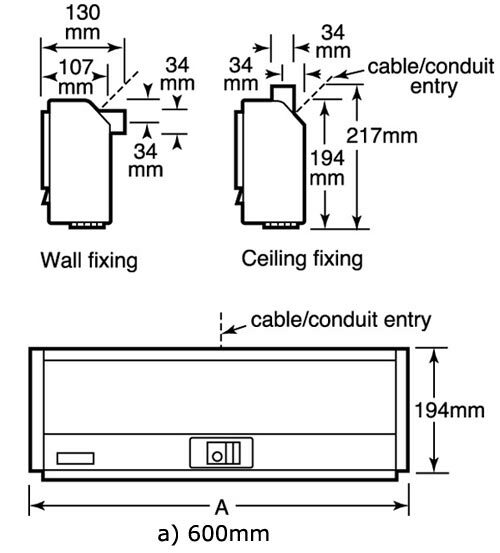 The electrical installation must be carried out by a competent electrician, and be in strict accordance with the current I.E.E regulations for Electrical Equipment in Buildings.The heater is fitted with a length of flexible cable type HO5VV-F size 3x10mm2 on models PLX075-200N, for connection to the fixed wiring of the premises through a suitable connection box positioned adjacent to the heater. Each heater has a detachable hinged wall mounting frame which eases and reduces time taken for installation, and enables the heater to be hinged forward for periodic cleaning. Heater secured to mounting frames for safety and security. If the heater is installed in a room containing a bath or shower, it must be so installed that switches and other controls cannot be touched by a person using the bath or shower.